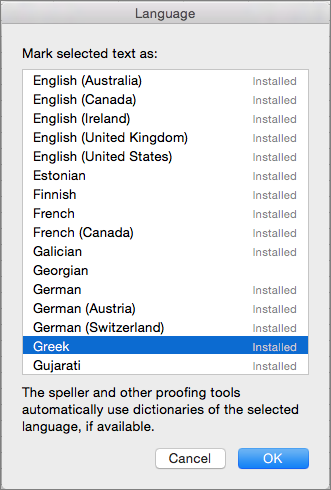 Depending on which language you are using, proofing tools can check spelling or grammar, hyphenate text, and look up words in the thesaurus. You can switch between proofing tools by selecting a different language for your document. See how to check spelling and grammar in a different language. To see if proofing tool for your language is available, on the Tools menu, click Language. Note: Proofing tools in Office for Mac are pre-installed. There are no additional downloads available. See the status next to your language. Here's a complete list of all the languages with the available proofing tool.